Aluminium Weather Louvre - Please contact us directly on 0161 336 5065 for bespoke products not listed as we specialise in made-to-measure vents and custom designs. A CVE Shop Weather Louvre will compliment any ventilation system and is specifically designed to protect against ingress by rainwater, vermin or debris. 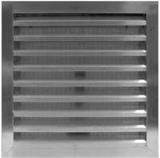 Weather Louvres are a very important feature of any supply or return air system. Where an external ventilation terminal is required, weather louvres are the global industry standard. As they are almost always mounted in external positions, it is important that they blend in with the building design whilst maintaining performance. CVE Shop Louvres have a high 50% free area and a specially designed blade profile to prevent water and vermin ingress. Rear bird/vermin mesh is incorporated as standard but this can easily be changed for insect mesh or stainless steel to suit your project requirements. The Aluminium Weather Louvre can also be made-to-order in sizes other than the standard sizes listed. There is no limit to louvre size however large louvres over 1500mm x 1500mm may need a bigger frame or blade pitch or produced in sections and bolted together. The standard 38mm blade pitch/32mm Frame weather louvres are normally used when the opening size is less than 1000mm square. Above this size we recommend using CVWL50 or CVWL75. Can be used in any application requiring permanent large-scale ventilation combined with screening such as air inlet and exhaust for ventilation or air conditioning systems, plant rooms, generators and pumping stations. Suitable for both supply and return air applications, CVWL38 louvres offer rain protection in almost all weather conditions. Weather Louvres are constructed from extruded aluminium sections, frame 3.0mm thick, blades 2.0mm thick. Fitted as standard with rear galvanised steel bird mesh screen secured with pop rivets. In order to calculate the exact overall face dimensions of the louvre +55mm must be added to the nominal opening dimensions required. CVWL38-500: The nominal opening size is 500mm x 500mm. The overall size including frame is 555mm x 555mm. Actual Neck Size: For clearance within the aperture a standard tolerance of -5mm (2.5 mm each side) is deducted from the nominal opening size. CVWL38-500: The nominal opening size is 500mm x 500mm. The actual neck size is 495mm x 495mm. Standard: Standard finish for this product is RAL 9006. Weather Louvres also available in: BS/RAL powder coated colours - please call for pricing. None - All our standard weather louvres are supplied with undrilled frames and no fixing screws. External louvres are usually secured through the flange or rear neck into the supporting structure. Predrilled Face Fixing Holes - appropriate to louvre size and weight with screws supplied in the same finish as the louvre. Non-standard louvre sizes are made-to-order, usually within 5 working days. For a quick quotation please complete the quote request form below including your full contact information. When completed, click 'Submit'. Your quote will be provided by email in PDF format. Do you need a wall liner? We have a sheet metal manufacturing facility on site and can fabricate galvanised steel wall liners to suit your requirements. Telescopic wall liners are also available to order which are very useful for situations where the exact sleeve length required cannot be determined. To obtain more insight about available options please call and speak with one of our friendly team now.